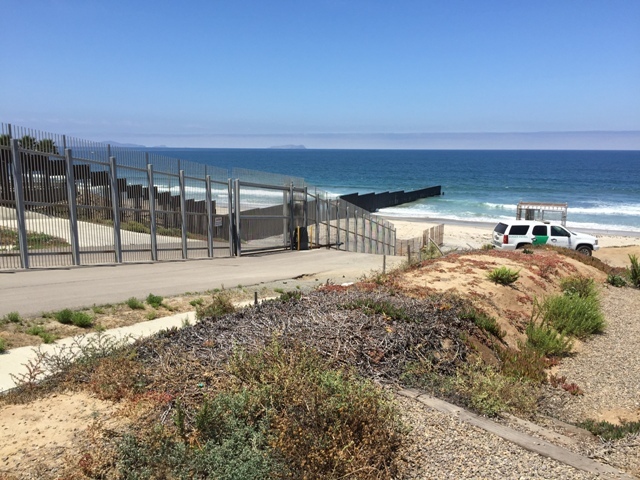 I lived for a decade in San Diego and reported on its two borders, the Pacific and Mexico. I recently returned to spend a few days in my old haunts including Ocean Beach, La Jolla and the border. I visited with Margaret Leinen, director of the Scripps Institution of Oceanography at its meandering cliffside campus in La Jolla. She told me of many new initiatives taking place there including a soon-to-be-created center for climate impacts and adaptation, a center to look at more traditional hazards such as earthquakes, volcanoes and tsunamis, ongoing work with creating ocean observation systems and a center on the ocean and human health that will go beyond our traditional focus on seafood safety and harmful algal blooms – or even bio-prospecting for the next cancer cure. It will investigate questions not presently being asked about organisms, bacteria and viruses and – my phrasing, not hers – why there hasn’t been a piscine SARS or bird flu (fish flu?) type outbreak to date. Are the billions of marine bacteria and viruses in the aerosolized sea spray we enjoy on our beach visits actually helping us develop immunity? We haven’t a clue, but perhaps once this center is up and running we will. I also took a media tour of the border area with folks from the binational environmental group WildCoast including its founder and now Imperial Beach Mayor Serge Dedina, staffers from state Assembly Speaker Toni Atkins’ office and Tijuana River Estuarine Reserve manager Chris Peregrin. This 2,000-acre border reserve is the largest salt marsh in Southern California and includes a surf zone, sand dunes, the marsh itself, fresh water forest and scrublands. The Tijuana River Valley in which it’s located looks a bit like a dry jungle DMZ on the U.S. side with scrub oak, sage, dusty two-lane roads, horse farms and roving green and white border patrol vehicles, also helicopters overhead. On the Mexican side of the U.S.-fortified triple fence is the growing city and beachfront of Tijuana. The International Wastewater Treatment Plant on the U.S. side and its outfall pipe going 3.5 miles offshore barely keeps up with the threat of increased sewage-based bacterial pollution. But today’s tour is focused on the massive piles of old tires that periodically flush through storm drains from the hills of Tijuana into the valley below. We walk along the sandy bed of the drought-starved Tijuana River hidden behind a curtain of willows, tamarisk and castor bean. Old tires and plastic trash litter its riparian bottomland. Excavations in the riverbed show tires and other trash at least 10 feet deep. The hope is to find a way to get Baja authorities to work with CalRecycle, the EPA and others to find a way to safely dispose of some 2 million old tires discarded in and around Tijuana every year, almost all of them imported from the U.S. under the NAFTA agreement. From the river, we visit a series of catchment basins, where front-loaders and other heavy equipment remove tons of sediment, tires and trash during winter storms before they inundate the salt marsh. Piles of rock are interwoven with kelp-like strands of plastic. We end our tour at Border Field State Park adjacent to the ocean and Tijuana Bullring. Last time I was here the park was closed except for la migra, the Border Patrol, and so, despite a redundant third fence-line recently constructed, I’m glad to see it’s reopened to the public. It’s got world-class views of a 20-mile crescent of Pacific coastline where least terns and other endangered seabirds now nest and a small gate where family members from both sides of the border can reunite and hold church services on certain permitted days. Despite the opportunistic jingoism of presidential candidate Donald Trump and his ilk, this gives me some hope knowing that the only way we can resolve our ocean and coastal challenges is through the triple bottom line of solutions that link the environment, the economy and social equity, a sentiment it turns out I share with his holiness the pope. 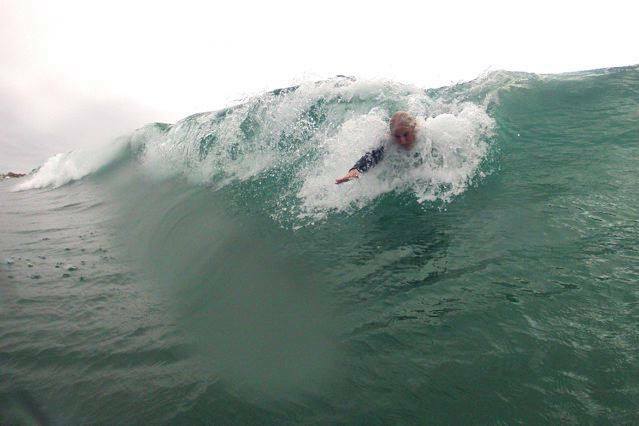 Back in my old neighborhood of Ocean Beach, I find the water temperature a fine 70 degrees and the bodysurfing restorative for both my body and soul.